NEWTON, Mass. — Maryland junior Maxine Fluharty scored 3 minutes into overtime to take Maryland past Duke 3-2 and into the finals of the ACC Field Hockey Championships. Off of a penalty corner, Fluharty collected a rebound in front of a crowded goal and tapped the ball past Blue Devil goalkeeper Lauren Blazing for her 12th goal of the season. The Terps were dominant throughout the game, peppering the Duke goal with wave after wave of attacking hockey right after the opening whistle. They were rewarded when forward Alyssa Parker put the Terrapins on the board first in the first half, as she deflected a shot by Jill Witmer past Blazing for her seventh tally of the season. Following several scoring chances that were either saved or fired wide, Maryland cashed in again, as Emma Rissinger scored her sixth goal of the season after Witmer sent another shot toward the cage. This time, Blazing allowed a rebound to her right that Rissinger punched home to give the Terrapins the two-goal lead. The first half was played mostly in Duke’s half, and under inclement weather. The unpredictable New England weather delivered sunshine, winds, sleet and rain throughout the first half, making playing conditions difficult both both teams. The Blue Devils came back well in the second half and managed to even the score with a strong second half that included five shots and two penalty corners. A goal by Abby Beltrani, her second of the season, off a pass from Grace Christus brought Duke to within one with 16 minutes remaining. With less than four minutes left in regulation, the Blue Devils knotted the contest at two on a goal by Hannah Barreca off of a penalty corner. Assisting on the tying goal was Beltrani and Emmie Le Marchand. Fluharty’s goal just under four minutes into overtime improved the Terrapins to 3-0 on the season in extra time. 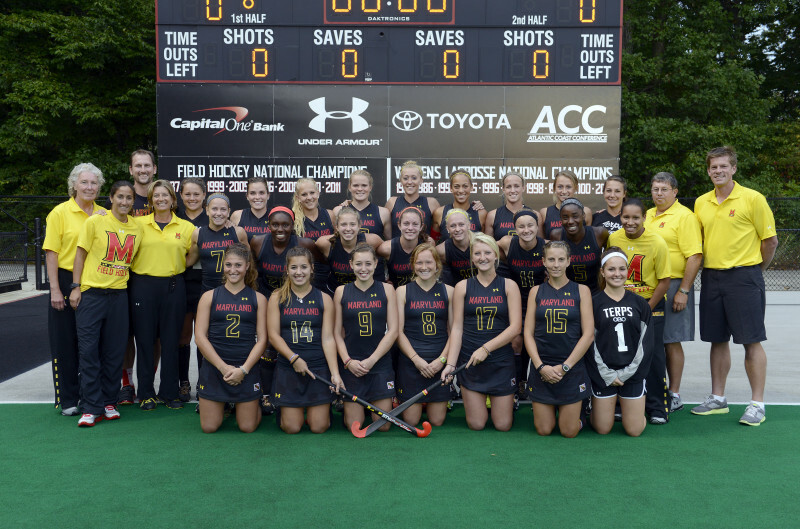 The Terrapins finished with 21 shots and five penalty corners, while Duke produced seven shots and five penalty corners. Maryland were easily the better team on the day, dominating the Blue Devils with aggressive running off the ball. The 19-1 ‘Terps’ are favorites to win the tournament.